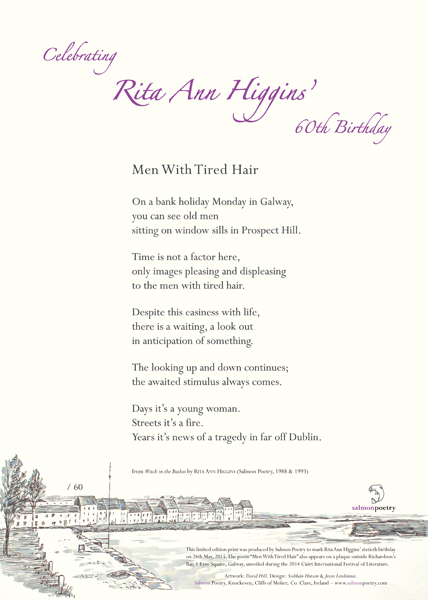 This limited edition print - there are only 60 and each is signed by Rita Ann Higgins - was produced by Salmon Poetry to mark Rita Ann's sixtieth birthday on 26th May, 2015. It features the poem “Men With Tired Hair” which was first published in Rita Ann's collection, Witch in the Bushes (Salmon Poetry, 1988 & 1993). The poem "Men with Tired Hair" also appears on a plaque outside Richardson’s Bar, 1 Eyre Square, Galway, Ireland, unveiled during the 2014 Cúirt International Festival of Literature. sitting on window sills in Prospect Hill. to the men with tired hair. the awaited stimulus always comes. Days it’s a young woman. Years it’s news of a tragedy in far off Dublin.